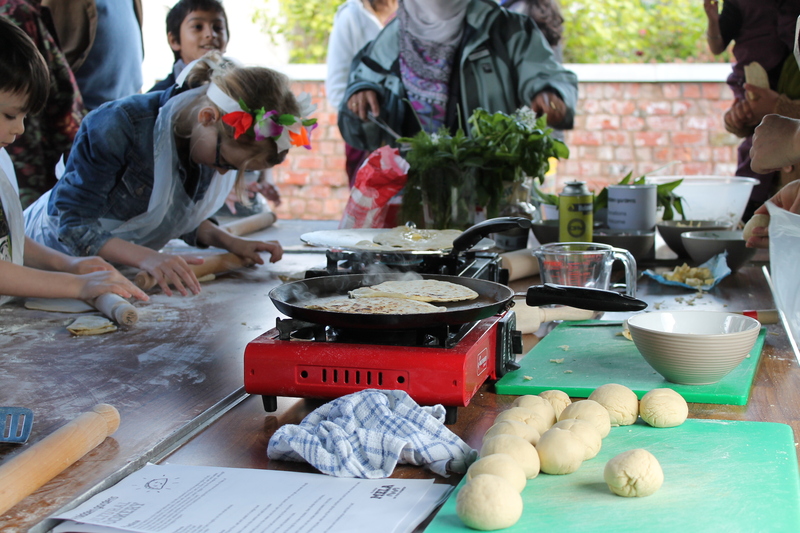 One of our flatbread making workshops during Mela on Your Doorstep – looks good! Thanks to everyone who came along to our Mela on Your Doorstep event on Saturday. We had a great time, and we hope you did too! Lots of fun events took place, including some cookery workshops where you could learn how to make your own chapatis, soda farls, and piadina. Delicious! For those of you who were unable to make it, you can take part in one of our flatbread making workshops in your very own kitchen by following these recipes. Which flatbread is your favourite? 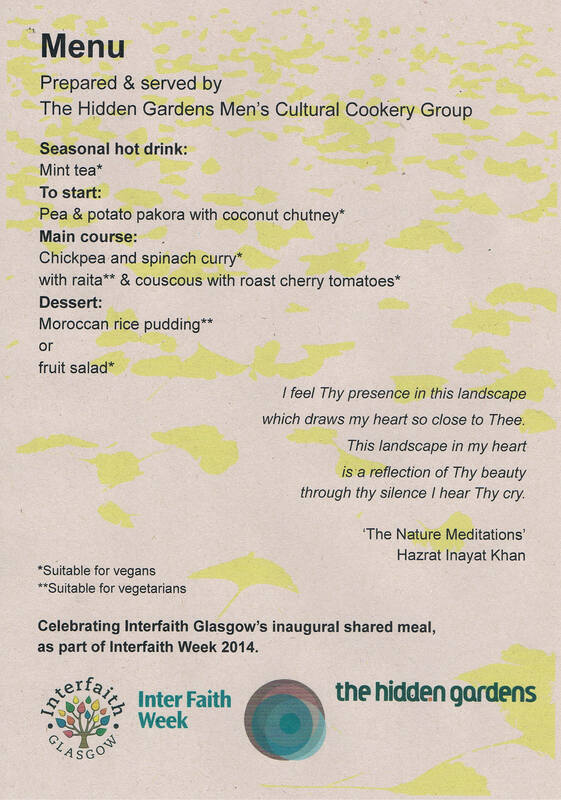 We were delighted to host Interfaith Glasgow‘s first in a series of Southside Interfaith meals last night, part of National Inter Faith Week celebrations. The Hidden Gardens Men’s Cultural Cookery group kindly volunteered their time to cater for the event, cooking a delicious vegetarian feast including: mint tea (harvested from the Gardens); pea and potato pakora served with coconut chutney; spinach and chickpea curry with raita and couscous with roast cherry tomatoes, and finally Moroccan rice pudding with fruit salad. The good food was accompanied by good conversation, and guests shared their thoughts of the evening on coloured leaves. These leaves will be collected after every meal and shared on a tree following the culmination of the meals later in 2015. 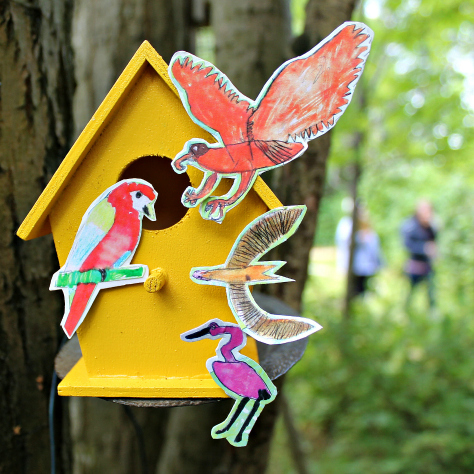 Last night the Hidden Gardens hosted the first in our series of interfaith community meals. The aim of these meals is to bring together people from different religious communities in the South East of Glasgow to share good food and good conversation in a relaxed and welcoming environment. Last night’s guests included members of the Muslim (Sunni and Shia), Baha’i, Christian, Buddhist, and Sikh traditions. 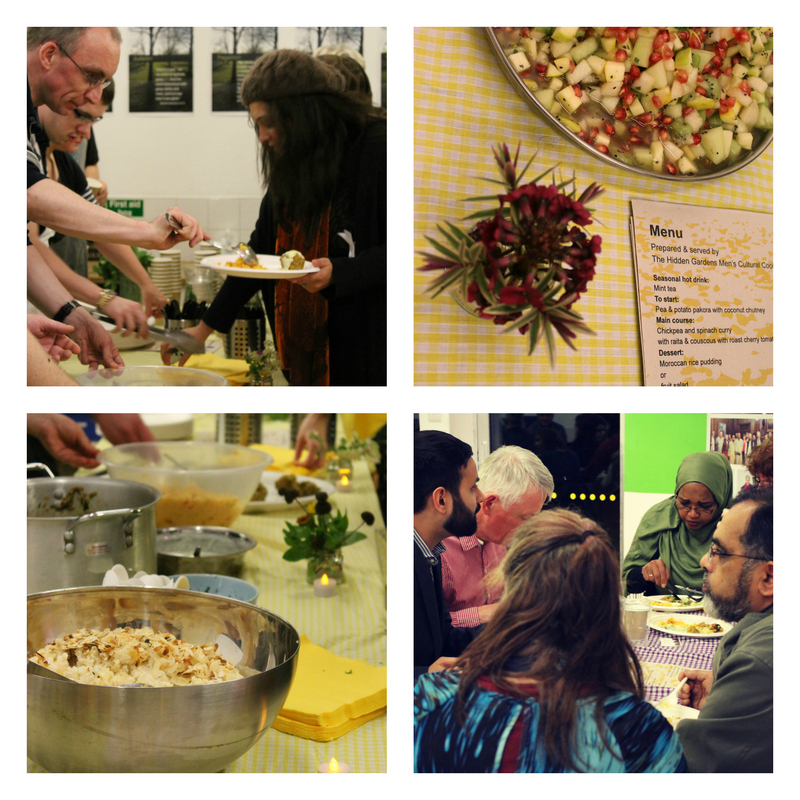 Delicious food was prepared by the Hidden Gardens’ cooking group and presented in an ambient setting conducive to dialogue on the theme of faith and nature. One guest wrote: “It is a fantastic event, I enjoyed the discussion at my table. … [F]aith should bring people together rather than separate them”. Our thanks go to The South East Integration Network (for funding this community meals project), the Hidden Gardens, and all the attendees for making last night so special. 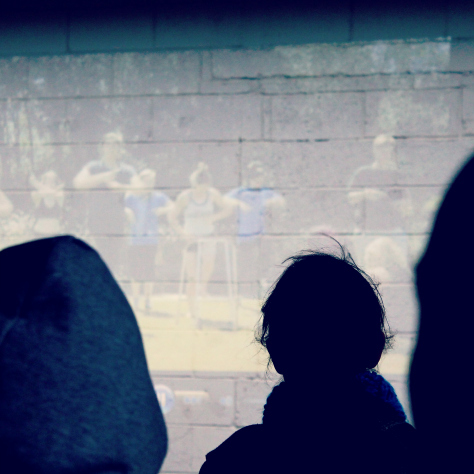 We had a great night last night at our bike-powered film screening. It was fantastic to see the films, which documented the excitement of the Commonwealth Youth Dance Festival and our Mandela Celebration, and in the case of the Commonwealth Youth Dance film, to be reminded of sunny summer weather! Many thanks to the young film-makers, our volunteers, and everyone who came along for the screening, discussion, and delicious food. For those of you who couldn’t make it along, we’ll be uploading the films to our website next month. Keep your eyes peeled! Produced by local young people, these short films depict community events that took place in The Hidden Gardens over the summer: our Mandela Celebration, and the Commonwealth Youth Dance Festival. 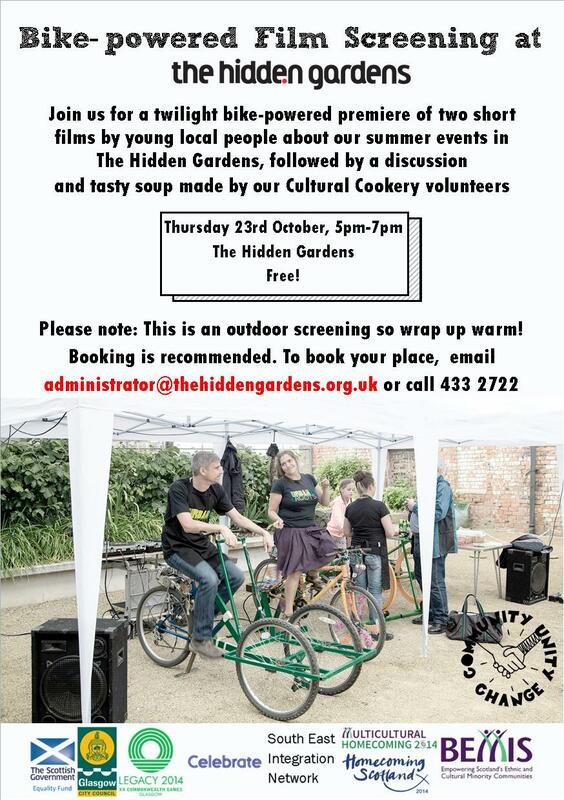 The screenings will be followed by a lively discussion over tasty homemade soup, made by our Cultural Cookery volunteers! The young film makers have captured the atmosphere and significance of the two recent events: our Mandela Celebration, a celebration of volunteering; and the Commonwealth Youth Dance Festival in which 500 young people from across the Commonwealth performed in Tramway and the Hidden Gardens. The films have common themes of ‘welcome’, ‘friendship’ and ‘peaceful togetherness’. The discussion will include time for us all to reflect on the impact of the ‘call to action’ launched at the Mandela Celebration to “Pledge 67 minutes to your community through volunteering”. We will be asking what are the needs of the community that volunteering can fulfil, what creative ways there are to use volunteers, and what action people want to take next. We hope you can join us for this fascinating event.